The first step is taken. 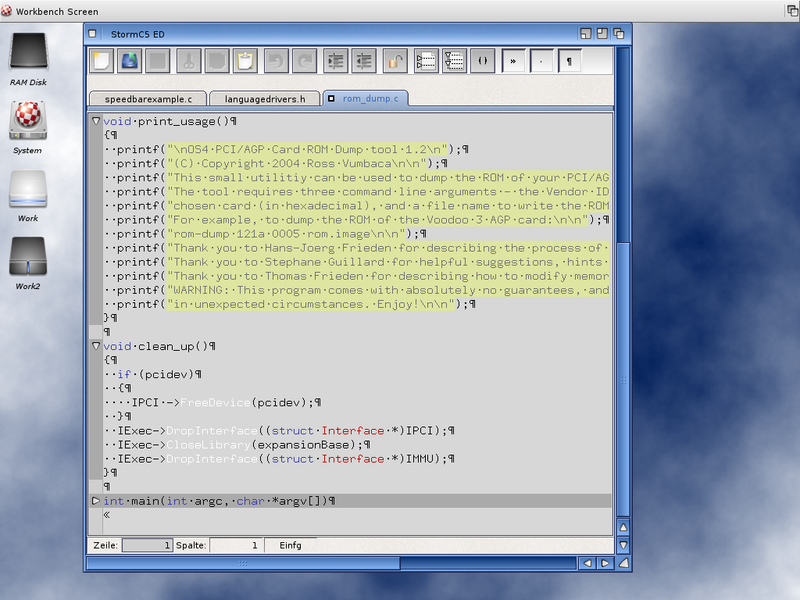 The editor module of the prospective StormC5 IDE is completed. It is all PPC native and everything is oriented towards future versions of AmigaOS 4.x. Experience the new StormC5-Editor with lots of new possibilities compared to previous versions and totally compliant to the Amiga look-and-feel. 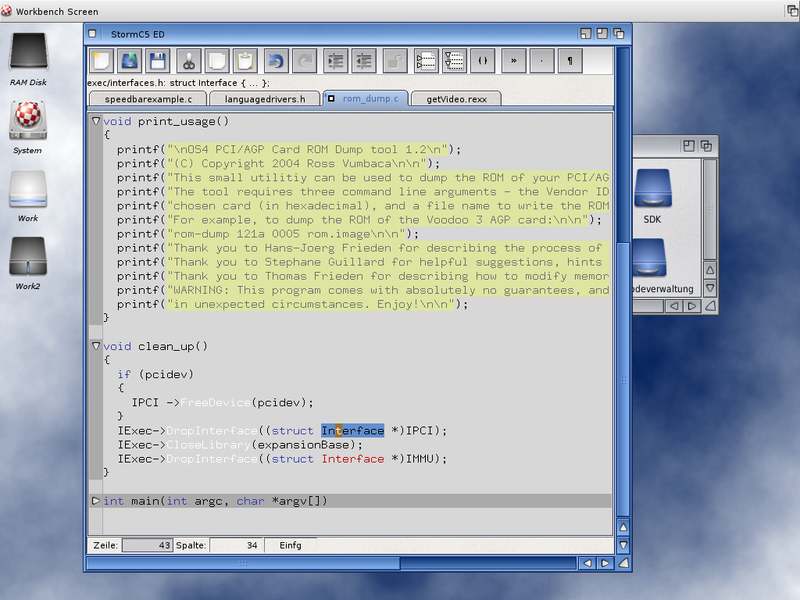 Join now, in a new kind of editing on AmigaOS 4.x! StormC5ED is available via download or CD. The download version costs only 29,95 Euro and the CD version 34,95 Euro. Order at once from our Online Shop. All keyboard shortcuts correspond to the AmigaOS specifications, toolbar images are supported, tooltips, etc. Dragging a file icon in an editor window or on the editor appicon will open that file. Lightning fast syntax highlighting, Recognized words can be highlighted with colour and/or font attributes. The driver for the syntax highlightning are applied as external modules. 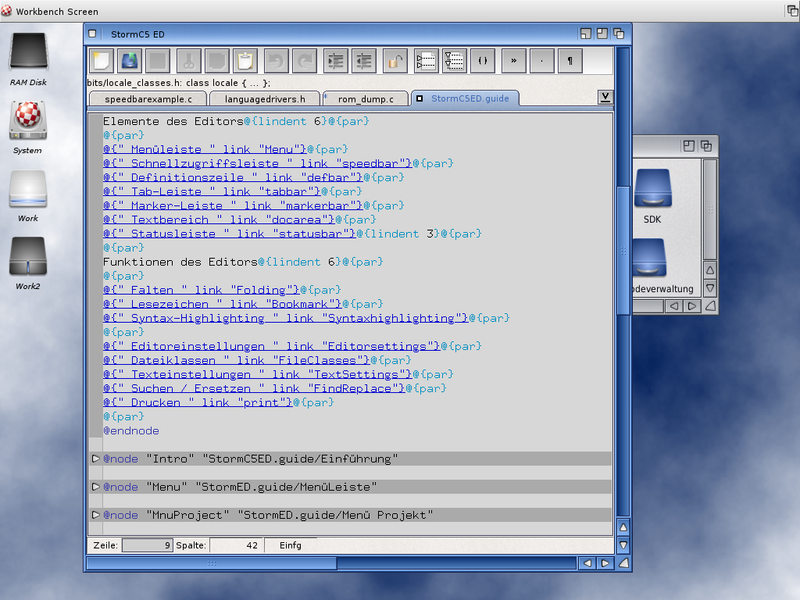 As a result, the editor is extensible for future tasks. For recognized words the relevant definition/Quick-Help is displayed. In a document an umlimited number of bookmarks can be set and jumped to with a keyboard shortcut. For example, so in C/C++ files, the method bodies are folded away for clarity and better readability of the code. Texts can be displayed either in a separate window for each text (MDI - multiple document interface) or all together in a single window with Tab control (TDI - Tabbed Document Interface). On typing of a character that initiates or terminates a block, the editor can react with different variations to increase or reduce the indentation ("keep your source code clean and tidy"). Optional displaying of these characters to find missing tabs in a "makefile", for example. In the basic package, the StormC5Ed interface has already been translated into 7 languages: German, English, Spanish, French, Italian, Danish and Russian are currently available. Other languages will follow. 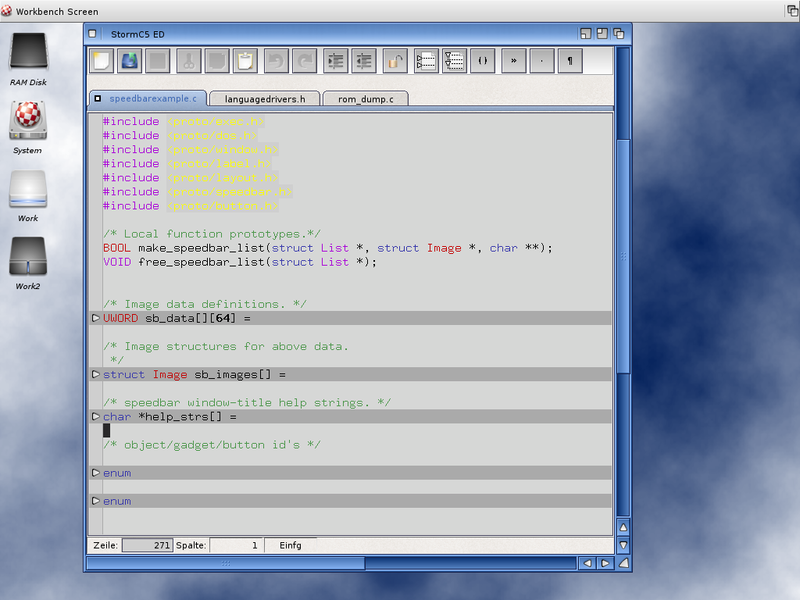 StormC5ED is the editor of the future StormC5 IDE. No press statements available at the moment.